Sometimes a book hits at the right time. 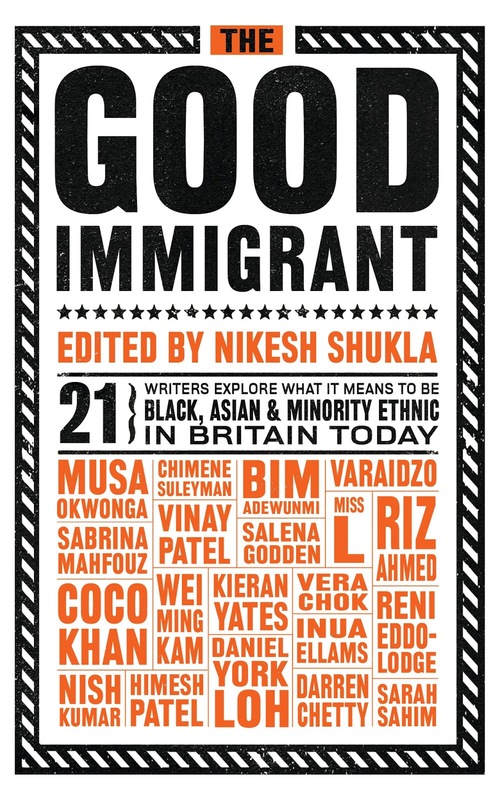 The Good Immigrant, edited by Nikesh Shukla and crowdfunded on the publishing platform Unbound, is one of those books. I’m heartbroken over the result of the EU referendum, saddened and angered by the surge in openly racist attacks, and all round worried about the future of the UK. And even before the referendum, who can have missed the discourse around immigrants in recent months, even years? From Prime Minister David Cameron calling refugees seeking shelter from war a “swarm” to Donald Trump’s plans to build a wall between Mexico and America and ban all Muslims from entering the US, it can seem like an awful time to not be white. So The Good Immigrant is both a soothing balm and a fiery call to action against the ugliness of the world today. As the daughter of immigrants, I have a particular interest in this book, but this collection of essays is essential reading for all human beings. It’s not a book of essays where non-white people moan about how they’re treated unfairly – it’s a collection of nuanced pieces looking at the immigrant experience, providing a state of the nation and serving as an eye-opening agent for change. During my reading I laughed, I fought back tears, I nodded in understanding, I got angry, and I also felt inspired. There is so much talent assembled in one book that it seems a little unfair to call out a few of the essays I particularly loved, but I’m going to anyway. First, of course, there is editor Nikesh Shukla himself, writing in an essay called Namaste, on the way language is appropriated, and why it’s important that we call people out on it. I’m a huge TV person, and will watch just about anything. But it annoys me that the majority of what we see on our screens is so white – where are the towns and cities that look like our actual towns and cities? Where are all the people of colour? Therefore, I adored Bim Adewunmi’s essay on tokenism and popular culture, and found myself nodding along to every word. We’re still so often judged on skin colour, so Miss L’s essay on how she is stereotyped because of the way she looks was powerful. And when she recounted how she was told by a teacher that the parts she’d be best suited to were those playing a terrorist’s wife, I got more than a little bit angry. Comedian Nish Kumar made me laugh out loud with his piece on how he became a meme. Yes, we Muslims definitely have massive, secret meetings where we discuss what one opinion we’re going to have on things. But for all the laughs, Kumar’s essay, like all the others in the book, made a serious point about how judgement about immigrants is still based on little more than a dismissive glance by many people. The essay which affected me most was probably Musa Okwonga’s on how immigrants and the children of immigrants have to be grateful all the time. In The Ungrateful Country Okwonga recounts how he realised that being grateful will never be enough for some people, that they will always judge you for your surface appearance or your name, and that by being eternally grateful you can never truly be yourself. The essay made me weep. The Good Immigrant is a sorely needed book, one that tells people immigrants shouldn’t need to be a white person’s ideal of ‘good’, shouldn’t need to be twice as good as a white person, to be accepted and loved. A powerful and uplifting and essential book, full of the words of talented, talented people, I hope The Good Immigrant can serve as a wake-up call for us all. *The Good Immigrant is out on September 22, 2016. Disclaimer: I donated to help crowdfund this book, and know the editor, Nikesh Shukla and some of the contributors.